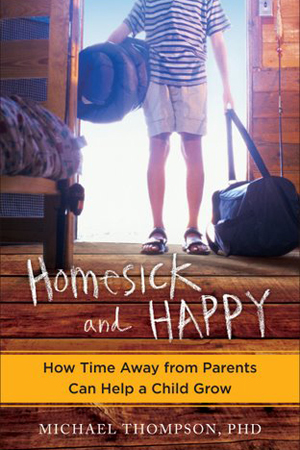 I cannot recall how many times that I have referenced Dr. Michael Thompson’s book, Homesick and Happy: How Time Away from Parents Can Help a Child Grow since it was published in 2012. While a majority of the book focuses on the value of summer camp experiences, chapter one presents a series of things that Dr. Thompson believes we cannot provide for our children. I believe this list is worth considering in the broader context of parenting and as we move forward during the school year together. We cannot make our children happy. We cannot give our children high self-esteem. We cannot make friends for our children or manage their friendships. We cannot double as our children’s agent, manager, or coach. We cannot create the “second family” for which our children yearn in order to facilitate their growth. We cannot compete with or limit our children’s total immersion in the online, digital, and social media realms. We cannot keep our children perfectly safe, but we can drive them crazy trying. We cannot make our children independent. Introducing the Head of School’s Blog! I would love a copy of your wallet-sized version. On another note – I will share a pivotal moment from my older daughter’s exposure to pre-school to reinforce Dr. Thompson’s messages. We lived in Manhattan at the time Lea was ready for pre-school. I was ambivalent, at best, regarding the pre-school application process and how competitive it was in NYC but decided to apply to one school that had a more “laid-back” reputation. Both Lea and I were interviewed. I have no idea what Lea said, but when I was asked what I wanted for Lea, I replied, that Freud’s definition of happiness, :was the ability to love and work.” When one reflects on all that would entail, I simply “wanted her to be able to give and receive love with worthy people over the course of her life and to find and do work that fed her passions and enabled her to contribute to the world in a positive and enduring manner.” A few weeks later, I received a very professional and supportive letter, rejecting Lea from the pre-school. Reason offered: I (her mother) didn’t have high enough aspirations for her so she wouldn’t be a good fit with the other students. That short statement affirmed my wish for her and led me directly to Quaker Education with no regrets 13 years later! Thank you for this reflection. I have not read Dr Thompson’s book, but as the mother of two young adults I agree that each child meets (or fails to meet) their developmental tasks when they are ready. Kahlil Gibran also said it slightly differently, “your children come through you but they are not from you”. I would argue, however, that while we cannot make our children live the life we wish for them, it is our job as parents to lay the foundation for a fertile life to develop, and the rest is truly up to the grace of God.